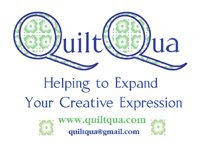 Sarcastic Quilter: Now I know I can make a skirt. Now I know I can make a skirt. I bought the Favorite Things Cute Skirts (V023) pattern a while back because I wanted to make a skirt for the Stash Bash. I cut everything out of my test fabrics and then got to sewing. The pattern was very easy to read and quick to do. This post is short and sweet so here you can see my progress. Pardon J, he was commenting I should make an apron out of it somewhere in the middle of the process. The slippers are the crowning touch. Love the skirt. I agree with Barbara- the slippers MAKE that outfit. Both you and the skirt look fabulous!